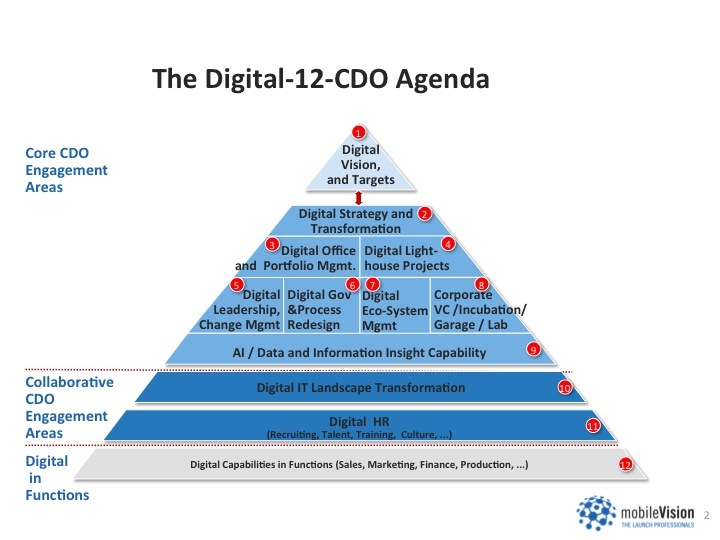 Our mV insights CDO Digital-12-Agenda Survey 2018 reviewed CDO’s status along mobileVision’s CDO agenda pyramid. 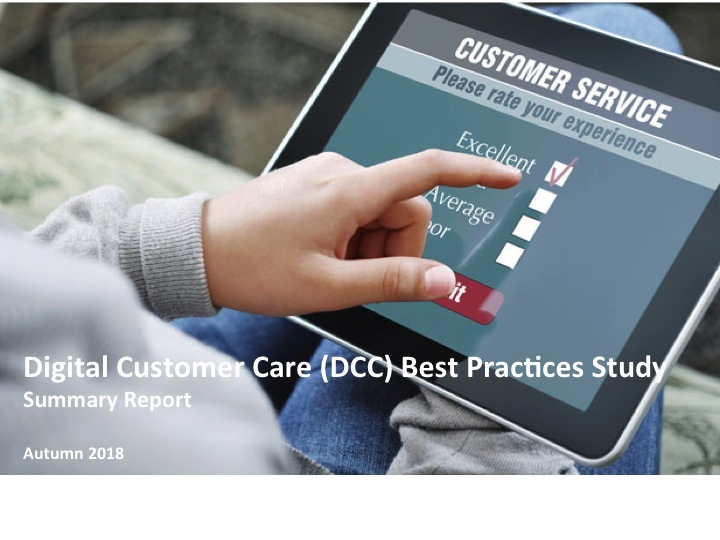 While good progress has obviously been made, the results also show that in early 2018 there remains a lot to be done on the way to a successful digital transformation! 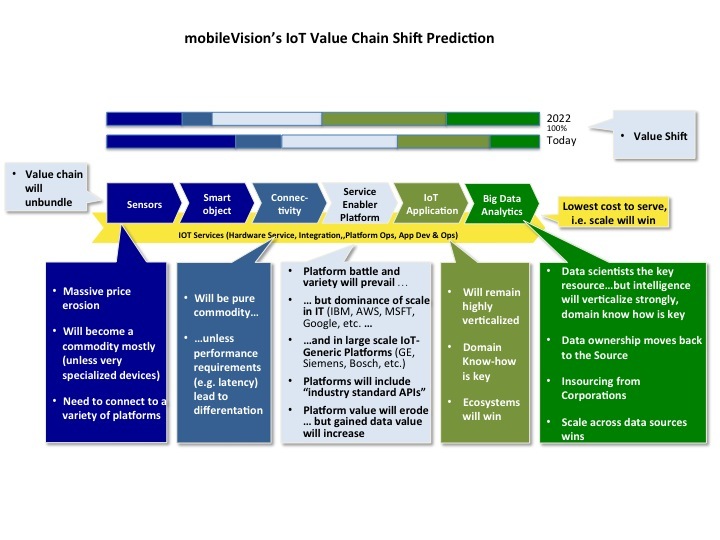 Digital visions and strategies are often neither disruptive nor comprehensive enough. Management is not sufficiently committed to and organizations do not fully understand their digital vision and strategy. In many cases these should be revisited and overhauled. Digital offices have been set up, digital initiatives are being executed and digital skills are being added. However, the value realized through these initiatives is often seen as disappointing and felt not to be significant. The value creation realized through digital initiatives and projects needs to be improved to power a successful digital transformation. Digital transformation is expected to significantly impact organization and processes. Execution is lagging with significant work and challenges in process digitization and organization changes as well as corresponding change management ahead. The CDO role is often neither fully empowered nor understood. Management needs to think through and fully endorse the position while filling the role with the right talent. Otherwise, many CDOs will fail against the high expectations. Successful CDOs will need to step up the digital transformation of their businesses. The CDO should demand and ensure sufficient empowerment. Inspirational leadership is required to ensure support and excitement; collaborative leadership will be needed in working with many other stakeholders across the organization. APIs are the connective fabric in today’s digital ecosystems. For companies who know how to develop an API strategy and implement and leverage them, they can cut costs, improve efficiency – and open new pathways to innovation and growth! APIs have been around for many years, but until recently they have largely treated as IT artefacts and a niche interest to programmers. In fact, APIs are one of these key foundational technologies that makes digital business possible and prosperous. APIs enable smart new ways of interacting with customers, expanding existing channels, allow businesses to monetize data, forge new profitable partnerships for digital services and innovation. Digital Transformations lead corporations to create the role of a Chief Digital Officer. 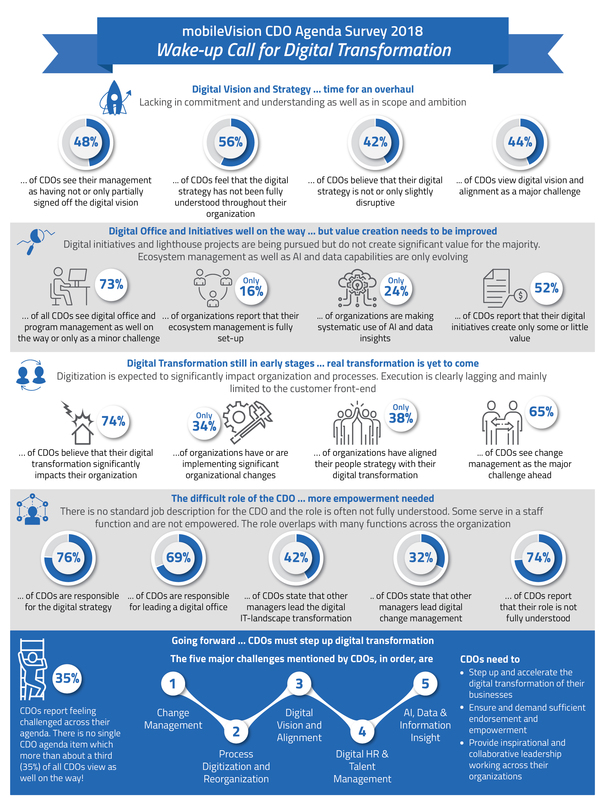 Our engagements reveal that fully functioning CDOs need to own a Digital-12-Agenda to master the digital transformation challenges. ALWAYS LOOK TWICE FOR DIGITAL TRANSFORMATION! mobileVision, ‘The Digital Growth Experts’ has entered into a strategic partnership with Twice Reply. Twice Reply focuses on consulting in Digital Transformation. From conception and development of a digital strategy and the design of a digital architecture to design thinking, technological implementation and process redesign, mobileVision and Twice Reply are the ideal partner for your digital transformation processes and innovation projects. We advise large and medium-sized companies in all sectors when it comes to the exploitation of new business opportunities. We optimize processes, organizations and technical infrastructure – resulting in enhanced performance of the business. Twice Reply http://www.reply.com/twice-reply/en is part of the global Reply Group network with more than 5.500 experts highly specialised companies, which support leading industrial groups in defining and developing business models to optimise and integrate processes, applications and devices, using new technology and communication paradigms, such as Big Data; Cloud Computing; Digital Communication; Internet of Things; Mobile and Social Networking. Debate with us how you see the CSP’s role in this play evolving!